With promises of Apple products for the best essay, over two hundred Vietnamese students shuffled into the U.S. Embassy’s event room despite the apocalyptic monsoons outside. The message “Just Do It: Write!,” written against a bright red background with yellow pencils, blared from a projector onto the back wall. 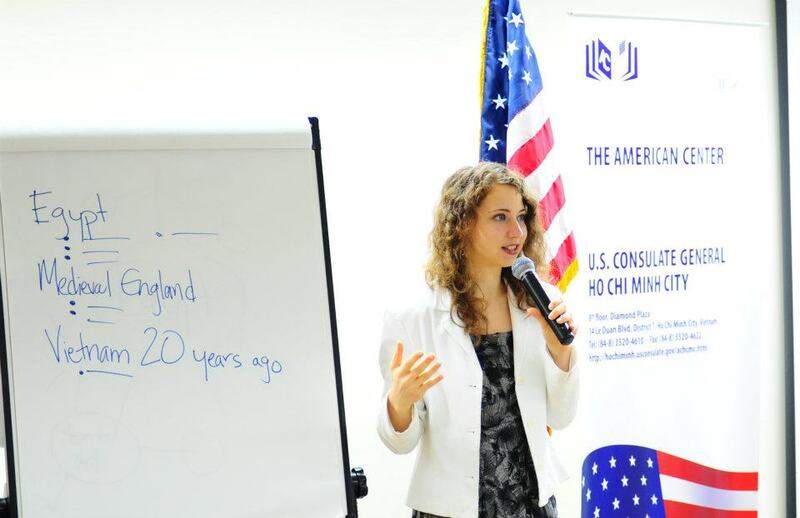 The American Center in Hanoi had organized a writing contest about American Presidents. The Public Affairs Section believed that I, the token English major among the five interns, could promote the contest by providing methods for effective writing. The students believed that I could help them win. I believed that the students could help each other win. I had an hour to link everyone’s expectations. The presentation continued in this candid, informal way. I discussed my favorite topics: writing as a process, writing as dialogue and as communication, writing to critique and reflect, the power of persuasive language through the use of word choice, and the mantra of “less is more.” The large event space felt like it had collapsed into a Writing Center room by the time fifteen minutes had passed. The group of sixty seemed much smaller and as I fellowed one student, my audience members were fellowing each other. The murmurs buzzing in the room excited me. Some members of my audience resisted freewriting and initially resisted sharing, but soon participated enthusiastically. I took forty-five minutes of questions, which ranged from successful introductions to organization of paragraphs to transitions (a popular question at the Barnard Writing Center). One student asked me, “Is it good or bad that I write while sitting on a table and crying?” I responded that it was good, referred to my slide on writing as reflection, and jokingly asked him to sit on a chair instead of a table the next time he writes. Ultimately, I do not know whether my audience understood some of the abstract writing concepts. I do not know if the presentation will help them win the American Center’s writing contest. But I hope that I eased some of their anxiety about the process, provided them with the confidence to write, encouraged them to fellow each other and themselves while drafting essays, and spurred them to enter the American Center’s writing contest. Next week I fly down south to Ho Chi Minh City to work in the Consular Office. Their American Center invited me to give a similar presentation! The powerpoint is available online through the American Center in Hanoi’s website. Update: Ho Chi Minh City’s American Center also drew over two hundred students. They treated my freewriting session differently, discussing ideas (or “fellowing”) with each other immediately. Since Ho Chi Minh’s American Center did not have a Writing Contest during that time, the students asked me questions about schoolwork and exams.